Pasta is such a huge part of the world of food that it would be a real shame if you needed to say ‘goodbye’ to it forever just because you are taking on a low carb lifestyle. Fortunately for today’s low carb dieters, there are plenty of options out there to help make sure that pasta lovers get to keep delicious Italian pasta dishes on their menu, without sacrificing any of the flavour. We’ve put together a handful of handy tips, and a few product recommendations, that will change how you think about pasta on a low carb diet plan. You have multiple choices for low carb noodles in all the classic styles, as well as every kind of sauce you can think of, including some new ones you may never have tried before. So, now that you’ve got pasta on your mind, let’s talk about how you can add pasta to your meal plan today! Traditional pasta noodles are usually made mostly from semolina flour, but this is definitely not something that works with a low carb diet. Even egg noodles can still contain a very high amount of carbs. For a low carb pasta dish, you’ll need to choose an alternative type of low carb noodle. The most popular low carb noodles are made from a combination of things like high-protein soy flour, wheat gluten, and fibre along with reduced amounts of semolina flour to bring the total carb count down. Some brands use other ingredients such as chickpeas and lentils in order to raise up the fibre and protein content and lower the total carbs. Shop our entire selection of low carb Italian noodles here – find exactly the kind of noodles you’ll need for your next pasta meal, all made with low carb ingredients. Shirataki noodles are Asian style noodles and are different from other types of low carb noodles because they are actually made from a water-soluble dietary fiber called ‘glucomannan’. This makes them very low in digestible carbs, and perfect for all kinds of Asian noodle recipes. Shirataki noodles are typically either white or seaweed, and come in several styles including long ramen-style noodles as well as more traditional shapes like spaghetti and fettuccine. You can browse a wide range of Shirataki noodles at The Low Carb Grocery. 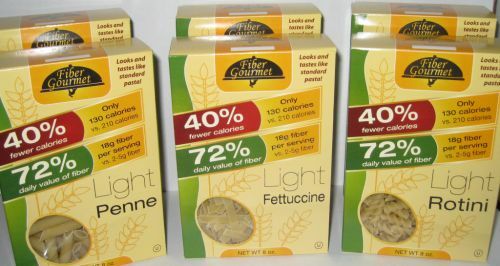 If you want to take on even more control over your pasta, consider making your own pasta noodles using the low carb flour options available from several different brands. When you hunt for recipes online, be sure to look for recipes that call for Wheat Protein Isolate 8000 and Oat Fibre 500. Of course, making noodles from scratch requires more planning and effort than simply choosing a pre-made pasta, but for those low carb chefs that like to do things their own way, all the ingredients you’ll need to make your own noodles can be found online or in store at The Low Carb Grocery. While there are dozens of different types of sauces to choose from, they all generally fall in to a few simple categories based on their core ingredients, or the style of cuisine. Here are the most common categories for sauces to go with your noodles. Most cream sauce recipes are already low in carbs, but also tend to be higher in fat. Cream sauces are ideal to pair with lighter meats such as chicken and seafood, or skip the meat and include your favourite veggies for a lighter meal. Tomatoes are a very common ingredient in a lot of Italian dishes, but since they can contain a lot of natural sugars they aren’t ideal for a low carb diet. Luckily there are several brands that have low carb versions of classic tomato sauces, so just be sure to choose a brand you trust, and always read the label. For a low carb pasta dish, pesto is just about as perfect as you can get! Since they are primarily made with an olive oil base, they are very safe for low carb dieters. You can try both the classic pesto sauces, or switch things up and opt for a creamy version. Pesto sauces are also very easy to make yourself using fresh local ingredients, no cooking required! If you are preparing an Asian dish such as a noodle stir fry, there several Asian style sauces to choose from like teriyaki, hoisin, or Szechuan, which are all available in low carb varieties and can be sweeter or spicier depending on the type of flavor experience you are looking for. Check out our full range of sauces for Italian style pasta and sauces for all other styles of cuisine – shop online or in store at The Low Carb Grocery. Once you’ve got the basis for your pasta dish down by choosing your noodles and your sauce, go ahead and customize it any way you want by adding your favourite meats and low carb vegetables to complete your meal. Pasta is one of those types of cuisine where it’s really fun to experiment with new tastes and flavour combos, so don’t be afraid to try new things. Now that you’ve probably got a serious craving for some pasta, take some time and browse around our entire Pasta & Noodle section to get even more inspiration. We have everything you need to make this a delicious and satisfying pasta meal you’ll remember and come back to again and again!